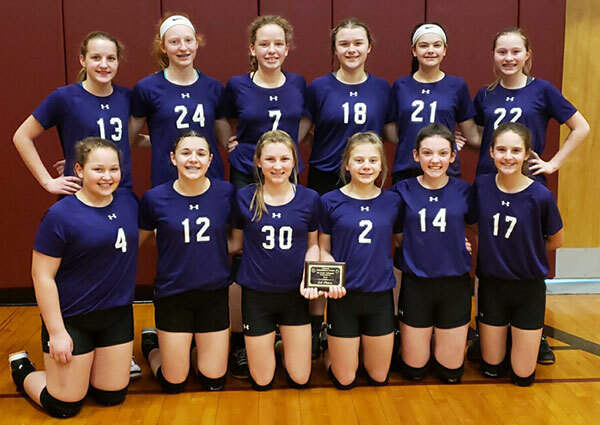 The Republic-Times Team of the Week is the Valmeyer Junior High School seventh grade volleyball team, which won first place in the Millstadt B Team Tournament over the weekend. The team features 10 seventh graders and two sixth graders and is currently 10-0 on the season. Pictured, front row, from left, are Courtney Schilling, Mia McSchooler, Hannah Gideon, Violet Krekel, Payton Similey and Ava Reeves; standing: Kate Lueck, Brooke Miller, Gracie Kohler, Grace Williams, Rylee Nagel and Kierstin Miller.